Blue cheese, rice wine, beer, pickled vegetables and glorious shelving! It’s been a while since my last productivity update, but as you can see I have been busy! I started a blue cheese on October 7th, and it bloomed faster than I’d expected. I inoculated the curds with a small chunk of a blue brie, which turned out to be not at all how blue brie is made. 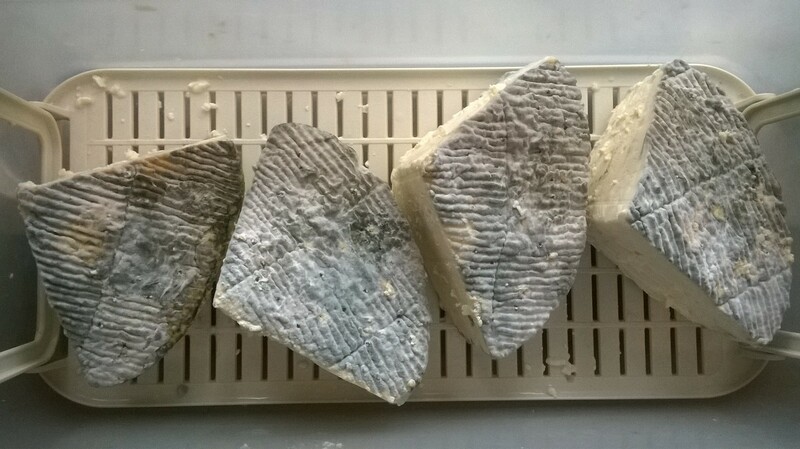 Apparently the way to make blue brie is to inoculate the curds as if making a blue, then scorch the surface of the cheese itself with hot water and re-inoculate with the white mould for brie. The trick is to keep the blue from overtaking the white. I’m quite happy to end up with a blue, so I’ve poked holes in the cheese to encourage the blue mould to grow inside. Apparently I’m supposed to scrape off the exterior mould at some point, at least once per month over the next three months. I want it to cover the cheese completely first, and since the mould has sprouted ahead of schedule I think it should be fine to leave it for a while. Hopefully it will be readyish in time for New Year’s. In other productivity news, I’ve been making and drinking rice wine more or less continuously. I may have mentioned previously that I find a strange allure in drinking the highly alcoholic liquid run-off from mouldy cooked rice. No one else seems to like it that much, but to me there’s a purity and pristine quality to it because it is little more than the product of rice, mould, and yeast. It’s so unprocessed and rustic. The red was admittedly a little disappointing, though it was made with glutinous rice instead of sushi rice. The white is quite sweet and seemingly of a higher alcohol concentration. I’ve forced myself to save a bottle of each to see how they age, and to share with returning friends. With the warmth of summer fast approaching, we’re back into beer season. I don’t consider myself a brewer, but I can follow a recipe well enough and friend J has given us an amazing recipe that is a clone of Stone Ruination, an American IPA. To buy Ruination in Australia would set you back $180 per carton. I’m not about to sample the real thing, but this clone has pretty much ruined me for lesser commercial beers. Coopers still hold their own as a very different beer, but I’ve been severely disappointed by some other “craft” brews that had as much flavour as one of my early failures where the post-boil volume somehow overshot the mark by about 5 litres! The great lemon-wine experiment has about reached its peak with the unhappy conundrum of what to do with 25 litres of poorly fermented overly sweet lemon wine. Unfortunately the answer turned out to be “bottle it” in a hurry, to free up a fermenter for beer purposes. I’ve been looking into stuck fermentation and may try to restart it later with some champagne yeast. 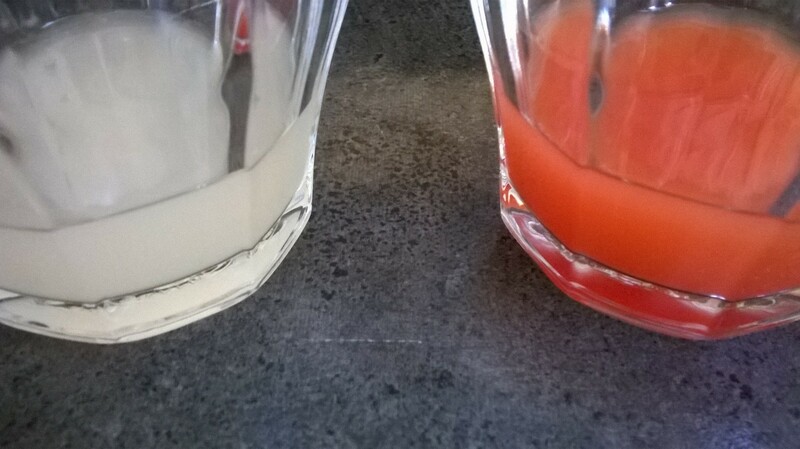 Various other little batches of lemon and lime wine are not so bad, having at least attained a reasonable level of fermentation, but lesson learned: don’t over-sweeten. Finally, we’ve started branching out a little into preserved vegetables. I managed to find a recipe for zha cai, a delicious condiment typically marketed as “preserved chinese vegetables” but actually made from the ugly bulbous root of the mustard plant. Apparently the process is very similar to kimchi: salt, marinade, and allow to ferment. We’ve started with something simpler in the form of preserved Chinese cabbage, which just sits in salt water and a bit of vinegar for a week. All of these activities require equipment and storage space, which has just become more readily available with the purchase of a cool room shelving rack! Dominating the landscape of our small kitchen, this four-tiered monolith can carry up to 100kg per shelf, and stands at 1.8m high, 1.5m wide, and .53m deep. It is now home to our microwave, coffee grinder and espresso machine all on one shelf, with others holding bags of rice, vegetables, cheese-esky, press, about 30 litres of beer and a dozen of aforementioned disappointing rice wine. It’s been such a benefit to us, we’ve only had it for seven days but it feels like it’s been with us forever. To top it off, we got it at about a third of retail value from an auction. Every now and then the wife and I like to just stand in the kitchen and gaze at it in awe.